What is the Lowrance Hook 5 Best For? Lowrance is a huge name in the realm of fish finders for good reason. They were the first company to release a sonar-operational fish finder back in 1957. Since then, they’ve been leaders in angling innovation. The company has consistently released fish finders with the newest available technology, and each one seems to be better than the one before. The Hook 5 was released as an upgrade to a previous model, the “Elite-5 CHIRP fish finder and chart plotter.” Though these two devices look very similar and have similar functionalities, the Hook 5 does have some qualities that make it stand out. This model is quite basic compared to other fish finders on the market, but that isn’t necessarily a bad thing. Some may prefer a less complicated device that does its main job, (fish finding), really well. There are some features to this tool that make it stand out among the rest. The main difference between the Hook 5 and the models that have come before are the display capabilities. This model has a five-inch square display screen, providing a little more room for information. The resolution is 480x480, which depicts details clearly and crisply without the signature graininess associated with many fish finders. 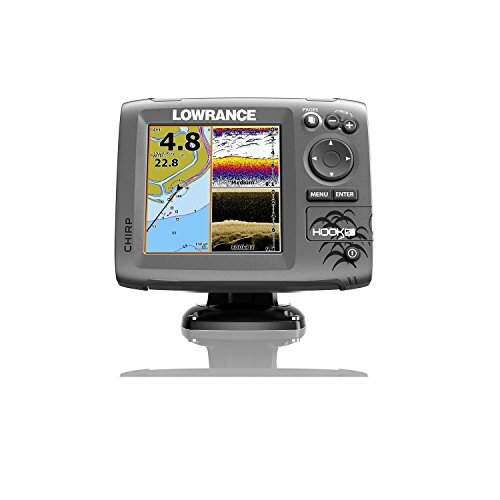 Like many other Lowrance fish finders, the Hook 5 uses industry-standard sonar capabilities, CHIRP, and DownScan. CHIRP works by putting energy into a column of water through slow sonar pulses transmitted from the device. It has been used by the U.S. military for many years. DownScan means that the device must be directly above the water to work, providing a view of what is below your boat rather than the surrounding areas. It’s a good feature for offshore anglers because it can provide a very clear depiction of what is happening below. Another special feature of this device is “trackback,” which allows the user to effectively look back at other fishing trips they’ve had and identify fishing hot spots. This is used in conjunction with a built-in GPS, which provides a map of more than 3,000 bodies of water. Multi-Window Display: With the extra space on the device, it’s now possible to have multiple data screens in one. They offer eight different layouts to choose from, including a three-panel split screen. The Hook 5 also features a newer menu system that is easy to navigate, and not to mention, all in one high-resolution color display. With Hybrid Dual Imaging (HDI), this device also features an option on the display screen to overlay, which combines DownScan and the CHIRP technology to give the best possible picture of the underwater scene. Navigation: The GPS on this system is quick and accurate, which is a must-have for offshore angling. Having a good GPS system is important not only for finding fish hot spots but also for safety. It can identify the shoreline as well as major underwater structures, which you may want to avoid. In addition, the Hook 5 has a feature called Insight Genesis Maps which allows users to create their own maps or modify already existing maps. There are also additional upgrades you can make to the device which allow it to record water temperatures at different locations. Advanced Signal Processing: A special feature for this fish finder, the Advanced Signal Processing (ASP), works to filter out signals from other finders in the area that would usually obstruct or interfere with your own sonar signals. Usability: Much like other Lowrance fish finders that have been released in the past, the instruction manual that comes along with this particular model is not great. Many users complain that details of how to operate the device are not as clear as they should be. Because of this learning gap, consider watching online tutorials or doing a little research before operating for the first time to learn how to use all of the functions correctly. Short Power Cord: Another minor inconvenience is the length of the power cord with this device. It is quite short, so if you have a larger boat, bring along an extension cord to ensure usability. The Hook 5 is a great choice for those looking for a more basic set up in a fish finder. The GPS capabilities of this device also make it suitable for boaters who want some direction in terms of mapping and recording their previous fishing trips. Having the ability to record details of previous trips can provide a great deal of insight for future sporting, ranging from fishing hot spots to underwater structures you should avoid. The size of this fish finder is compact enough that it makes it an easy travel partner. It won’t burden your load with extra weight when hiking to an ice fishing spot, and it’s also easy to fit into a suitcase for extended travel. Because the finder relies on DownScan to provide an accurate picture, meaning it must be above a column of water, this is a device only for offshore anglers, rather than onshore. In summary, the Hook 5 does it’s main, most important job very well. Thanks to DownScan, CHIRP, and HDI, this fish finder is not likely to fail in identifying fish under the surface. This isn’t a surprise considering Lowrance, the first company to release a sonar fish finder, had a hand in creating the device. As aforementioned, this finder does have a bit of a learning curve. While the basic functionalities are simple enough to figure out, some of the additional features may be difficult to understand at first. This isn’t necessarily a deal-breaker, but just know that you may have to do some research upon operating the device aside from reading the instruction manual. If you’re an offshore angler hoping to increase your chances of getting your next great catch, this high-quality fish finder might just be the right choice for you.